The US LVTP-5 Family (Landing Vehicle, Tracked, Personnel) was a amphibious armored fighting vehicle used by the United States Marine Corps. It was designed by the BorgWarner company and built by FMC (Food Machinery Corporation) along with a few other companies. It was first accepted into service in 1956. Some 1,124 basic units were produced, plus the specialist variants, and many saw action in the Vietnam War. It was an evolution of the LVT-1 to LVT-4 World War II era Landing Vehicle Tracked series, but was considerably larger and could carry 30-34 combat-armed troops. A smaller design based on the M59 APC was also produced as the LVT-6, but only a handful built. The LVTP-5 was replaced in service by the AAV family. 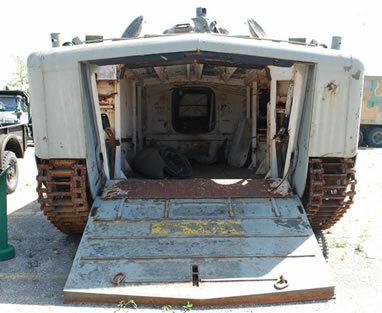 LVTP-5 (Landing Vehicle Tracked, Personnel) – armored personnel carrier. LVTC-5 (Landing Vehicle, Tracked, Command) – command vehicle. LVTH-6 (Landing Vehicle, Tracked, Howitzer) – fire support variant armed with 105 mm howitzer. 210 units built. LVTR-1 (Landing Vehicle, Tracked, Recovery) – recovery vehicle. 65 units built. LVTE-1 (Landing Vehicle, Tracked, Engineer) – mine-sweeper. 41 units built. LVTAA-X1 (Landing Vehicle, Tracked, Anti Aircraft) – anti-aircraft variant, to be fitted with the turret of the M42 Duster. Only prototype built.